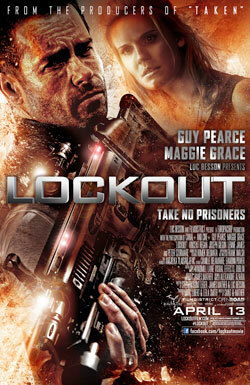 Lockout Movie Trailer and Poster. Guy Pearce, Maggie Grace and Peter Stormare star in the sci-fi prison break movie. See the movie trailer, photos and poster for Lockout below. Set in the near future, Lockout follows a falsely convicted ex-government agent (Pearce), whose one chance at obtaining freedom lies in the dangerous mission of rescuing the President’s daughter (Grace) from rioting convicts at an outer space maximum security prison. MPAA Rating: PG-13 for intense sequences of violence and action, and language including some sexual references. MS One maximum-security space station is a prison where 500 most dangerous criminals in the world are kept in an artificial sleep. Responsible for a humanitarian mission, the daughter of the President of the United States, Emilie Warnock (Maggie Grace), arrives aboard the station. A mutiny of rare violence breaks out. Emilie and MS One team are taken hostage by the inmates. The President decides to send ex-government agent Snow (Guy Pearce) with the sole mission to save his daughter and no one else.